HANSON – John J. Ferry, Sr., 92, the proprietor of Ferry’s Automotive, Inc. of Hanson, and a decorated veteran of World War II, died peacefully on a beautiful Sunday morning at home surrounded by his family. Mr. Ferry was a B-25 flight engineer-gunner in the China-Burma-India theater of the war, flying 75 missions during that time and achieving the rank of staff sergeant. 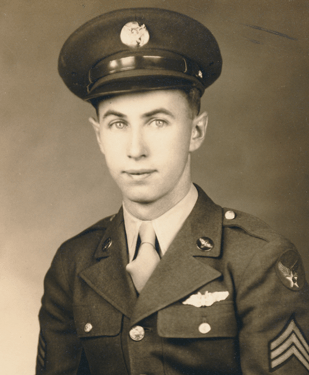 He served with the 83rd Bomb Squadron, 12th Bomb Group of the 10th Air Force. He received the Distinguished Flying Cross, the Air Medal with three bronze Oak Leaf Clusters, seven Bronze Stars, the Good Conduct Medal, and the Asiatic Pacific Service Medal. Mr. Ferry was born on Sept. 30, 1923, in Halifax, where he loved to spend time on the Twin Lakes when he wasn’t bothering his four beloved sisters. He graduated from Whitman High School before joining the armed services in 1942. An avid mechanic, he worked for Bryantville Olds after the war, and then Lloyd’s Garage in Hanson. In 1954, he married Dorothea “Dot” Girouard, and built their home on Winter Street in Hanson. In 1965, he opened John’s Jenney in Hanson, which became John’s Citgo in 1968. In 1975, he opened Ferry’s Automotive Inc. – better known as “Ferry’s Sunoco” – on Liberty Street in Hanson. 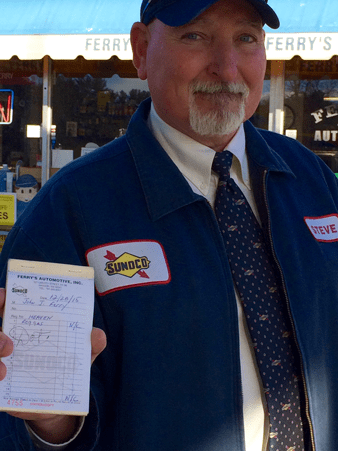 This year, Ferry’s Sunoco celebrated its 50th year of operation. The business was his great passion, and he loved to spend nearly all of his time at “the station,” where he worked alongside his son, daughter, grandchildren, and many beloved friends. When his health began to prevent him from working long hours on his feet, Mr. Ferry still spent every afternoon at the station, visiting with his many customers and friends. He is predeceased by his son James “Jimmy” Ferry, and leaves his wife of 61 years, Dorothea M. Ferry, his son John J. Ferry, Jr. and his wife Kathleen of Hanson, his daughters Victoria Miller and her fiancé Beau Dyer of Plympton, Vivienne Gilbert and her husband Andrew of Hanson, and Vanessa Ferry of Hanson. He also leaves his six grandchildren: Erik Miller, Sara and Taylor Ferry, and Cassandra, Cory, and Kelsey Gilbert. His services will be held at 8 a.m., Monday, Dec. 28 from the Blanchard Funeral Chapel, Plymouth Street (Route 58 at the rotary) Whitman, followed by a funeral Mass at 9 a.m. in St. Joseph the Worker Church, Hanson. Burial will follow in Central Cemetery, Halifax. Visiting hours will be held from 2 to 6 p.m., Sunday Dec. 27. In lieu of flowers, please make donations to Whitman-Hanson Dollars for Scholars, P. O. Box 26, Whitman, MA, 02382.